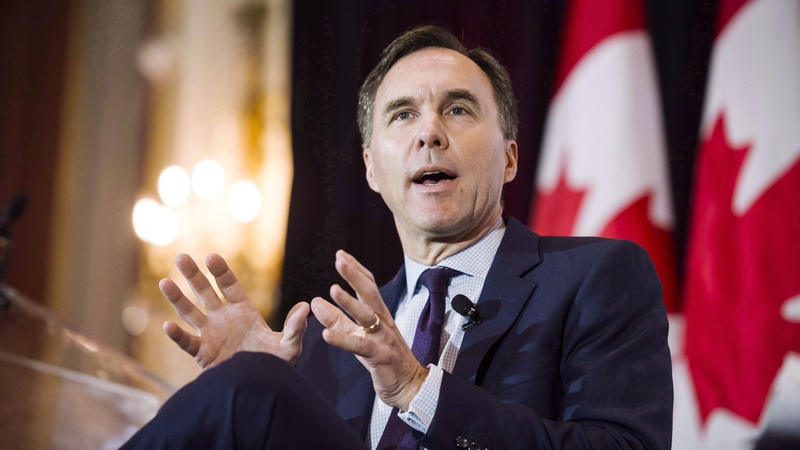 Finance Minister Bill Morneau is defending the federal government's approach to supporting Canada's beleaguered oil patch as he encounters criticism over the lack of targeted relief in his fall update. "We are in a difficult spot from the standpoint of the price differential," Morneau told Bloomberg's Josh Wingrove in a broadcast interview for BNN Bloomberg late Wednesday. "The most important long-term thing that we can do is get access to international markets. That's why the purchase of the Trans Mountain pipeline and expansion is so important." The federal government struck a deal in May to buy Trans Mountain and the pipeline's proposed expansion from Kinder Morgan Canada for $4.5 billion, after the energy company suspended work on the project as it faced intense opposition. Only a few months later, the government was dealt a major setback when the Federal Court of Appeal quashed the expansion's approval, citing deficiencies in the National Energy Board's review process. The lack of new pipeline takeaway capacity has contributed to a painful drop in Canada oil prices, with the price of Western Canadian Select falling as low as US$13.27 per barrel on Nov. 15, while its discount against West Texas Intermediate, the North American crude benchmark, widened to as much as US$52.40 per barrel in early October. "It's a very difficult problem [and] I know there's going to be a lot of continuing work to think about how we might be able to improve the situation," Morneau said in the interview. Canoe Financial chairman Brett Wilson and Business Council of Canada head Goldy Hyder wrap up their discussion on the fall fiscal update and what the tax break means for big businesses. The federal budget update has drawn criticism from some in Western Canada, including Canoe Financial Chairman W. Brett Wilson. "Let's start with what was offered to Alberta: Nothing. It's a waste of breath and a waste of paper," Wilson said in an interview with BNN Bloomberg. In the face of that type of criticism, Morneau defended his strategy and suggested there was no silver bullet solution that the federal government could have included in the fall update to address the challenges facing Alberta's oil sector. "There is not, in my estimation, any short-term measure we can do to solve the problem," he added. "Certainly, I know that there are businesses in the sector in Alberta that are talking to the Alberta government. We are watching carefully what's going on there, but ensuring that we focus on how we can make sure that, in the long-term, we get to the right answer."